The clock is winding down on our time in Yosemite – there are so many things to do and see. But, we’re both so stiff & sore after yesterday’s climb to the Falls that we can hardly move. We finally decide to take a (flat) hike down to Mirror Lake. 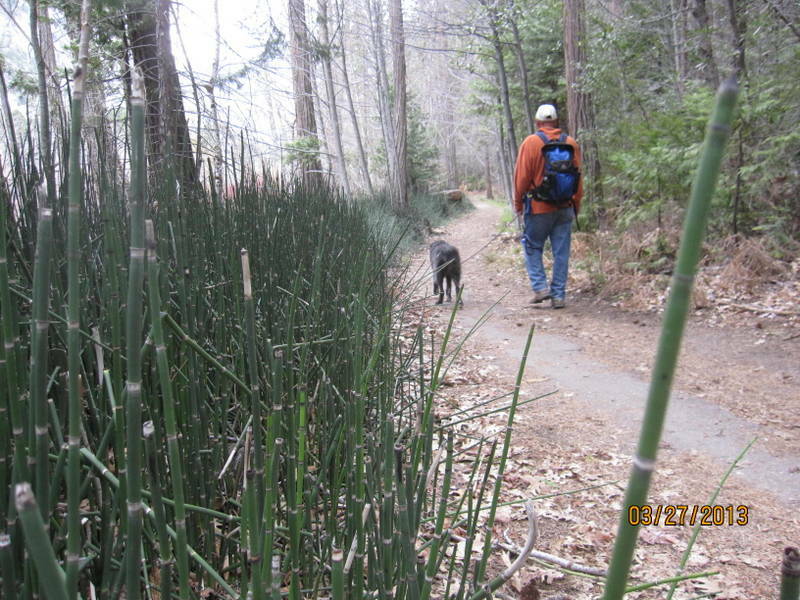 It’s a chance to take Jezzy along, so three happy campers hit the Trail. You know how it goes when you’re in a new place, and you just want to see what’s around the next corner? 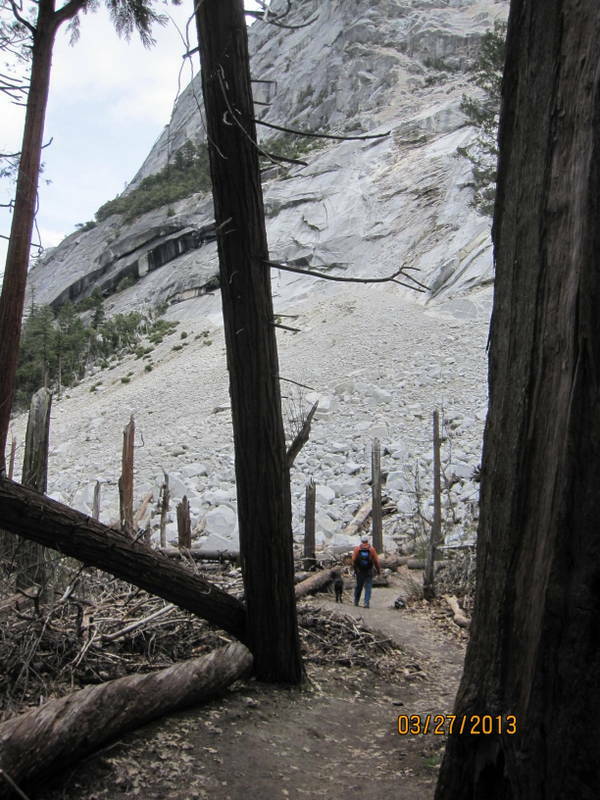 Our little walk turned into a six-mile hike, past some Yosemite scenery totally different than what we had experienced. 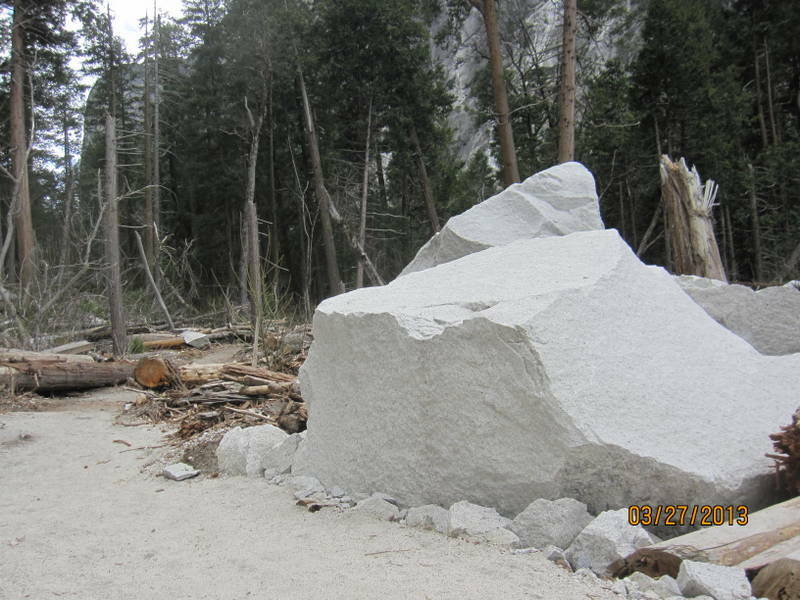 We passed a rock slide area, where enormous white granite boulders had come smashing down the mountain, into a grove of redwoods. You wouldn’t want to be here when the rocks let go! Twisted three trunks and piles of rocks were everywhere. I always wonder what such an event sounds like and feels like. Always interesting to contemplate. 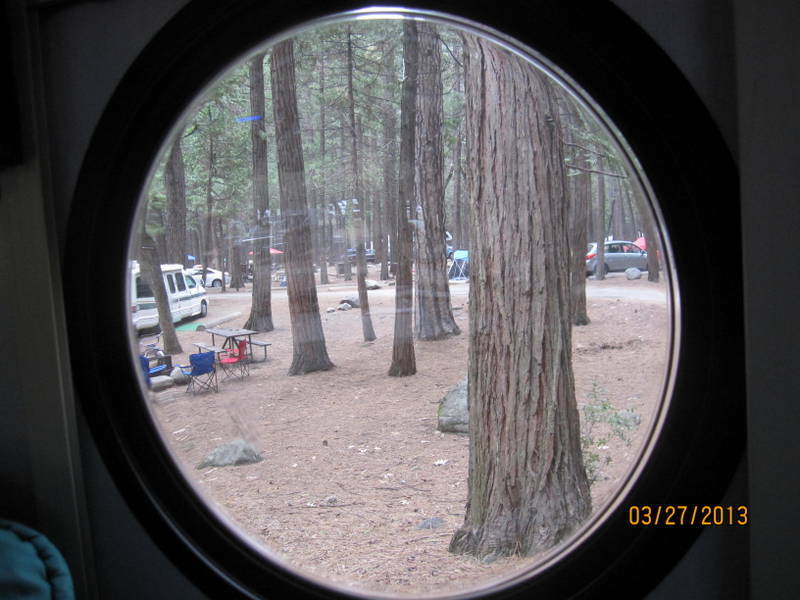 porthole view from our campsite. We decide to try to get an early start on our last day – it’s a fairly short travel day (about 180 miles), but we never know how long our travel time will be. A detour to the Mariposa Grove (Sequoia) just at the Yosemite exit gives us our first glimpse of the giant trees. They are stunning. It’s difficult to comprehend 2000 year old, living trees. 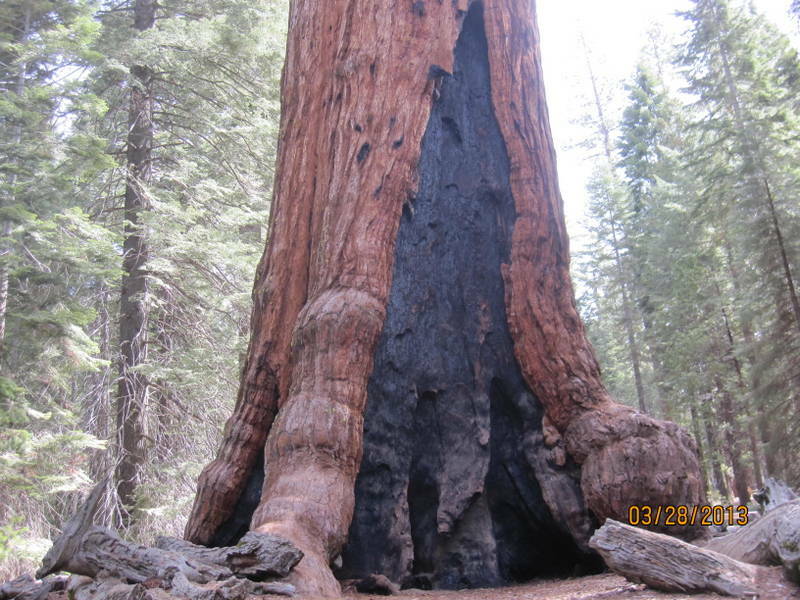 Their sheer size is overwhelming – some are 40-45 feet in diameter. Hard to comprehend how big these are. Naturally, we hike farther and farther into the Grove, stopping to stare and take a few photos, and wonder at these trees. For me, this is by far the best part of our trip so far. So, our early start has dissipated, but we don’t care. Our plan is to stop at a small town along the road, and find a Laundromat. We strike gold with a Laundromat next door to a sushi restaurant which will actually deliver to the laundry. Spring rolls and spicy tuna take the drudgery out of doing some nasty camping laundry, for sure. On the road again, we peel off at Trader Joe’s in Fresno to restock the larder for another three or four days of camping. Then, on to Island Park Campground, somewhere in the foothills near Kings Canyon National Park. All of the sudden, we’re in the lush California foothills of the Sierra Nevadas. No more desert and rock – everything is lush and fuzzy-warm. The roadside is a riot of color with strawflowers, California poppies, and lavender everywhere. Our campground is at on the shore of this lake. Groves of orange trees are still loaded with fruit. 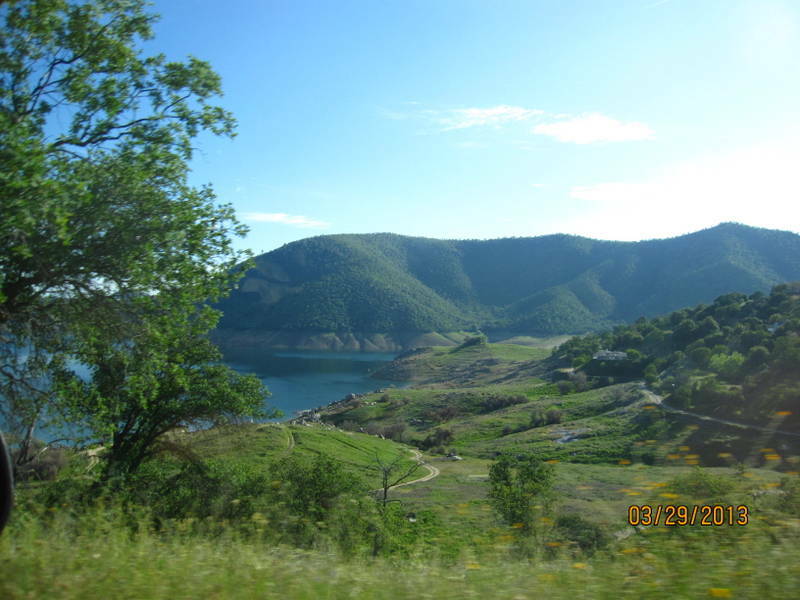 The hills are grass-covered, and studded with boulders and green trees. Our campground is at the very bottom of yet another twisty road. Very interesting campground….our space is pretty narrow, and up a hill. John has to back the Fireball up into this narrow slot, which is the most unlevel site we can imagine. We’ve got one side of the Fireball jacked up so high to make it level that we have to leap out the door. That first step is a killer! Will have to take a photo, just so we can remember this…. Our camp neighbors are a huge extended family that has been camping at this park Easter week for over 25 years. What a compound they’ve established. There must be at least 80 of them, spread out all over the campground, and we’re dropped right into the middle. I’ll bet they brought a cord of firewood with them. There are bunches of kids, all who want to pet Jezzy and chat us up. It’s camp life at its greatest. 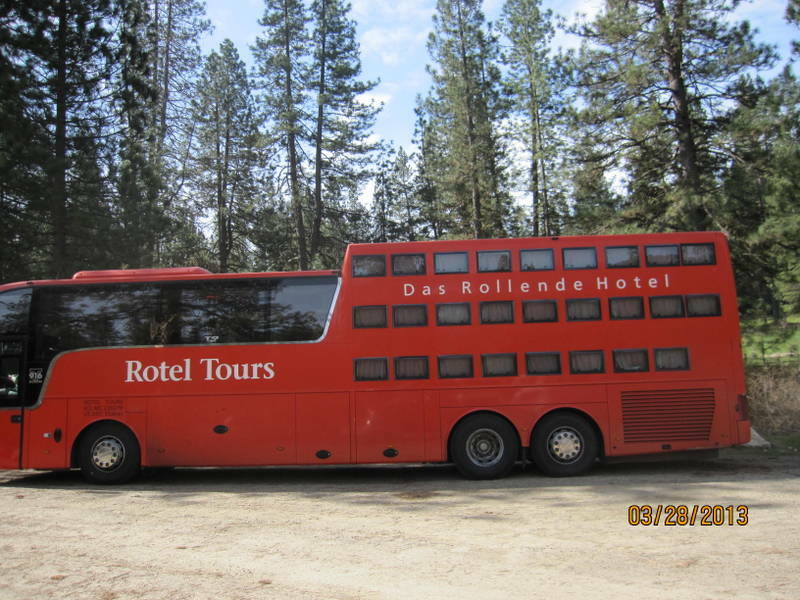 This entry was posted in California, great outdoors, hiking, national parks, simple camping, T@DA and tagged California, camping, hiking, historic sites, RV life, simple camping, T@DA, Yosemite by Judy Crankshaw. Bookmark the permalink. 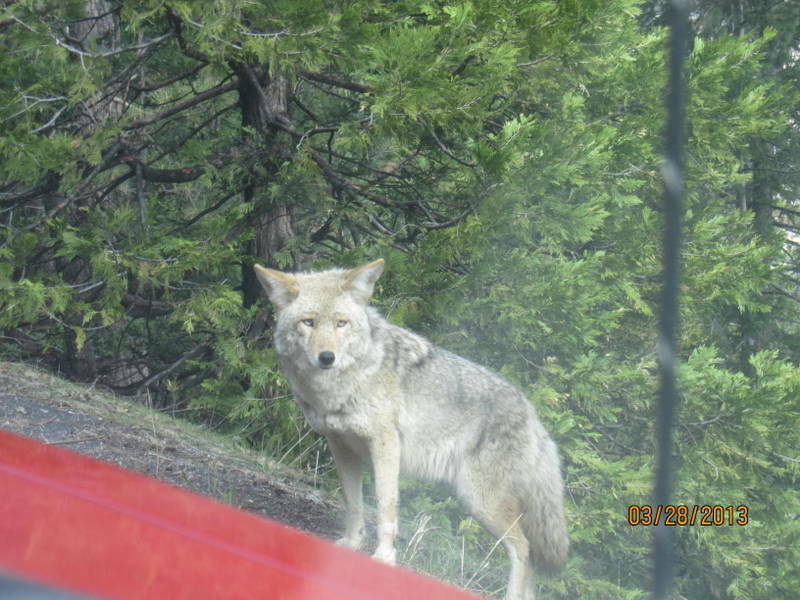 I love the coyote photo! I also enjoyed Sequoia and did some wonder/pondering there. Enjoy your travels! Thanks – Sequoia is amazing, isn’t it? We are having a blast. Decent weather is a big part of that.